I had a lot of trouble with the formatting of this article, so I just had to put the information into excel and made some jpeg files out of the information which look blurry on the blog, but will be clear if you click on them. 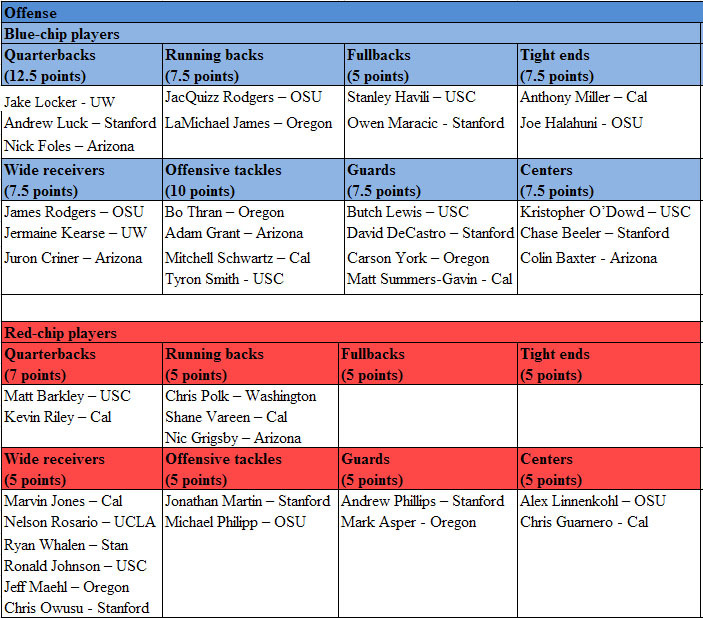 Mike Lombardi came up with this blue-chip formula to determine how much talent is on each team in the NFL, but I only follow former Pac-10 players and wanted to see how our conference would look applying the same scoring system. 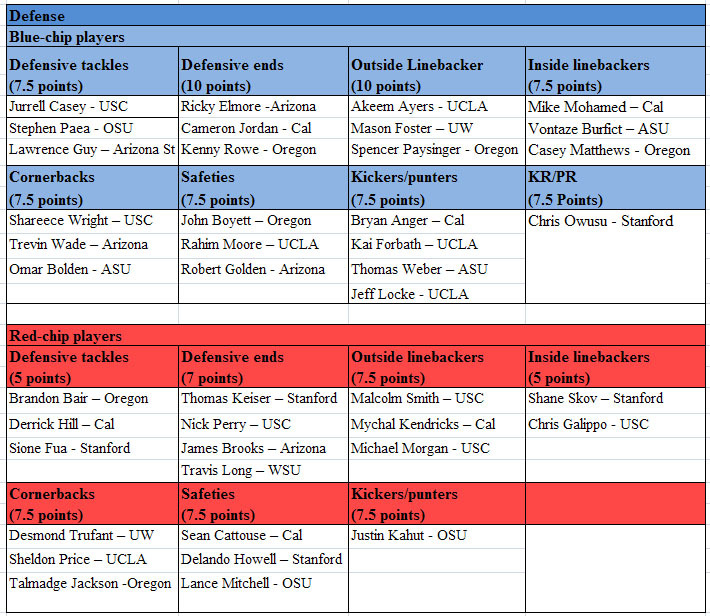 The outside linebackers account for 2.5 more points than the middle linebackers, which makes sense for the NFL where most teams are using a 3-4 defense, but the majority of teams in college are still using a four man front and the middle linebacker can impact the game more than an outside linebacker – think Casey Matthews of Oregon and Vontaze Burfict of ASU. I was also concerned that the red chip secondary players received the same 7.5 points as the blue chip players. There are many talented players in the NFL secondaries, but in college there aren’t that many cornerbacks and safeties that would make as big of an impact as many of the blue chip players at other positions. Arizona has a total of 80 points with a good mix of offensive and defensive players, with points coming from both the skill positions and in the trenches. Arizona State only has 30 points with 22.5 of those coming from the defensive side of the ball, so don’t expect them to be lighting up the scoreboard any time soon. Cal surprised me with 82 points, but Tedford has recruited as well as any coach in the conference not named Pete Carroll. Oregon brings 82.5 points with strength in the trenches. I think Casey Matthews is more valuable to their defense than the 7.5 points he’s allotted, but Paysinger received a higher rating in the formula and evened out the same number of points I would have given them combined. Oregon State has a lot of skill players, but without much depth in the trenches their team only accounts for 55 points so this tells me that they should be relying on the big plays this season. Stanford brings almost all of their 67.5 points on the offensive side of the ball. Chris Owusu probably would have made the list as the next red-chip wide receiver, but he gets 7.5 points for his kick return abilities. UCLA will be carried by their defense and special teams this year, but that’s two thirds of the game so maybe they’ll do better than the 8th place finish the media projected them for. Still, they are only bringing 45 points to the table and having a kicker be the most dangerous weapon on your offense is never a good sign. USC is stocked with talent throughout the roster so it’s no surprise that they are the Leader of the Pac with 84 points in the blue chip scoring. The Washington Huskies totaled 42.5 points and will be relying on a strong passing game to win some games for them, but there’s not much talent on the offensive or defensive lines. Here’s all of the team points in alphabetical order and these are pretty consistent with my conference predictions which were posted a month ago. Strength – Quarterback- Jordan Wynn didn’t start until the 9th game of the season, but he had his best performance in the Poinsettia Bowl against Cal, throwing for 338 yards on 26 of 36 passing and earning the MVP award. He was a true freshman last year and he should improve with some experience under his belt. The backup Terrence Cain will provide some quality depth at the position as he has started 8 games with a 7-1 record. Weakness – Linebacker – The Utes lost all of their starting LB’s from last year, but their D- line returns all four starters (Sealver Siliga, Dave Kruger, Lei Talamaivao, and Christian Cox) and should take some pressure off of the inexperienced players. Strength – Rodgers Brothers – Oregon St has the Pac-12’s best RB – Jacquizz Rodgers, and the best WR – James Rodgers. These two should ease the transition of a new QB after the loss of first team All-Pac 10 QB Sean Canfield. Weakness – Quarterback – When a conference is loaded at the QB position, it doesn’t help to be the only team with an inexperienced player at the helm. Ryan Katz is the favorite heading into the season, but his only action last year was in mop-up duty. The Rodgers brothers will make his job easier, but he still needs to prove himself. Strength – Linebacker – The Trojans welcome back all three starters from a year ago (Malcolm Smith, Chris Gallipo, and Michael Morgan) with possibly the best player of the bunch backing up a couple positions, Devon Kennard. This group will need to be more consistent this year, because there’s not much depth outside of Kennard. Weakness – Secondary – It’s been five years since Taylor Mays hasn’t lined up in the secondary for USC, but they also lost the rest of their starters in the secondary. Shareece Wright was the #1 CB on the team before being ruled academically ineligible last season, but made an impact when he returned for the bowl game. USC has stockpiled talent up and down their roster for years, but their secondary was inconsistent last year even with Mays in the lineup. With the conference stacked at the QB position, their new defensive coordinator – Monte Kiffin, will have his hands full in the fall. Even though the Ducks lost arguably their best player and a handful of others to off-field troubles, the Ducks bring back plenty of key pieces from their 2009 Pac-10 championship team. They have a tougher schedule ahead of them this year, and less depth than a year ago, but the experience gained should make up for it. Strength – Running back – LaMichael James quickly made people forget about LaGarrette Blount when he stepped right in and ripped off 1,600 yards rushing. The Ducks also brought in the highly touted blue chip recruit Lache Seastrunk who should provide some depth at the position. Weakness – QB – While it’s tough to find a weakness from a team that just won the conference championship and returns 18 starters, the quarterback position is still unknown. Chip Kelly’s spread offense relies on a QB that can run the ball and that’s where Jeremiah Masoli excelled, (even though he couldn’t run from the law). Nate Costa was ahead of Masoli on the depth chart before tearing his ACL, but he’s in a tight battle with Darron Thomas heading into the fall.